Top-J. Crew (similar), Skirt-H&M (similar), Shoes-Steve Madden, Necklace-c/o Sorrelli, Sunglasses-Karen Walker, Clutch-Clare Vivier c/o La Boutique SF, Lipstick-Maybelline "Fuchsia Fever"
Another masculine & feminine mix up. I like what I like. Absolutely love this outfit and your blog in general. The H&M skirt, when did you buy that? I love the colour! Pink + denim + leopard = a perfect outfit! Looking absolutely gorgeous! Wowwwwww! the Steve Madden shoes are fantastic!!!! I love them! Love the mix of the neon pink with the denim shirt. Cute, cute, cute ...! fantastic outfit, one of my favorites, love the denim shirt and skirt combo! I love the way the pink pops in this look! nothing wrong with masculine/feminine mixes, either! A 'pinch' of pink! What a riot! XD ~You look absolutely flirty and fabulous. The pink and leopard go great together, but the denim really ties it together. I especially love your jewelry with the outfit. How do you always come up with outfits I wanna try? Love that skirt. And those heels are amazing. Your skirt is total eye candy. And will always love anything leopard print. you like what you like & you wear it well =) this is more like a shout of pink and i love it. have been wanting these shoes since their debut on your blog. Seriously amazing! You have an impeccable taste, this is so perfect, bright pink and leopard always a winner! and it always looks gorgeous! I have a workout inspired post today, swing by for some motivation pre CrossFit! lovely outfit. the skirt ans shoes i just love them. What a fantastic skirt! Looks like I need to visit H&M more often! I following your blog , could you come in my blog? WANNNTT THat pink skirt!! Looks great with the leopard heels! That skirt is SO gorgeous! Love the hot pink colored, and love the way you've styled it (especially with the leopard!) Adorable! I love this look, masculine + feminine = perfection!! your pink skirt is the best color and i love those sunnies!! Love it! Must find leopard print heels! Amazing. Must be pink and leopard day - I did something similar (but not as cool) this morning. Blue + Purple looks Great Together! Beautiful outfit. Love the skirt and clutch. I love this outfit! The shoes are gorgeous and the color of your skirt in just fabulous. You look amazing! Great look! The pink and leopard print work so well together. 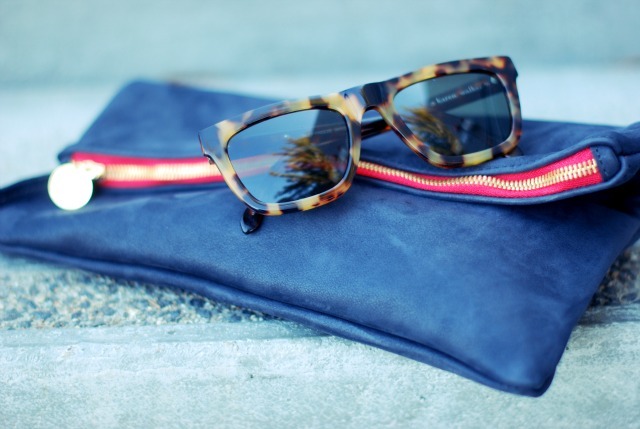 And I also like how the tortoise shell shades complement the denim AND the leopard print on bottom. Oooh I totally LOVE that skirt. Looks great with your top and the clutch. I'm in love with the combination of the chambray, pink and 'diamonds'. It's beautiful. eek! that skirt is amazing! lovely look! I love the masculine/feminine mix! That chambray top is brilliant with the floaty pink skirt, and I love your sunglasses! As usual, you look great in pink!! Great accessories too. I love the bright pink and blue!! So cute! And we like it, too! You are so beautiful! gorgeous! i actually have all of these pieces... now, inspired to copy your look! ohhh... love the skirt and glasses!!! lovely skirt! beautiful pictures! those heels are amazing! those heels are awesome! Nothing like the pairing of HOT PINK and leopard. Love it all. Hope you are having a great week. Pink & leopard is such a good combo! Love this!! Totally loving the pink skirt!!! 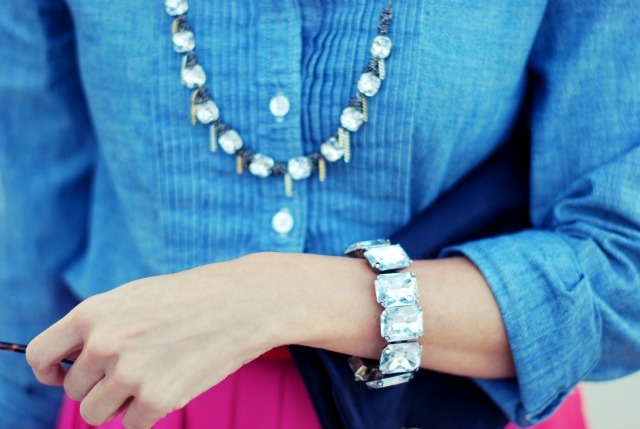 I love the chambray and pink together! You style everything wonderfully. great look! love the heels. Very cute splash of pink. I love the contrast against the denim and sparkles! Love this look, that clutch is amazing! I love the denim top with the pretty, feminine skirt and giiirl I love leopard print. This outfit is perfection! oh i need that skirt! so fun and long enough for teaching! Love the leopard platforms... take a look at a similar pair by Pour la Victoire in my Weekend Wishlist. LOVING this hot pink and denim look! I love how you always add a touch of leopard. So appropriate at all times in my book! i can never find skirts like that at my nearest H&M! you must have a great one... this is one of the greatest outfits to date! Great outfit. I love the tortoise-shell and the leopard beginning and finishing the story. another lovely outfit - the splash of pink is such an unexpected choice with denim! love the shoes and shades!